Dynasty Bathrooms is a one-stop-shop for all of your renovation needs. From flooring to lighting and everything in between! We carry products to suit any style any budget. Our two Winnipeg showrooms showcase thousands of items and displays for bathroom and kitchen renovations offering ideas and design inspiration. We install what we sell! Our very own installers provide quality workmanship, and professional installation. No job is too big or too small. On Special right now at Dynasty Bathrooms! 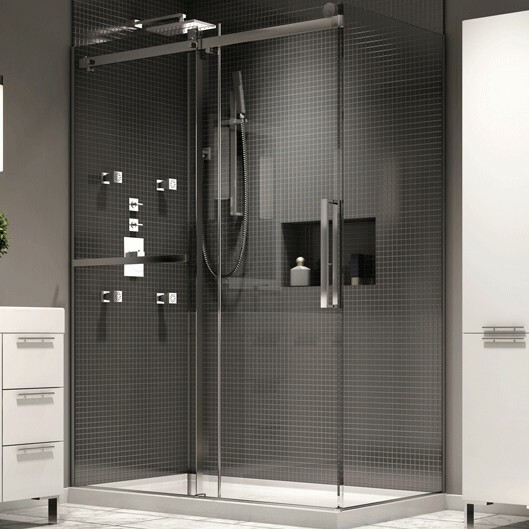 The Exalt Shower doors are a high-end frameless design with superior rolling system and 8mm thickness. These doors come with one fixed panel and one sliding panel with an option of a return panel if being used in a corner layout (as shown here). The Cache Base offers a contemporary style with exclusive hidden drain, for a sleek look and feel. Lengths can range from 36″ to 60″ and widths from 32″ to 36″. The base comes as an easy entry 3″ high threshold and has varying tiling flange options to choose from. Available to purchase at either location. On Display at 3-996 Lorimer Blvd. Please know that our two Winnipeg showrooms will be closed on Good Friday as well as the day following, Saturday April 20th, to allow our hand working associates a nice holiday long weekend. We will be open regular hours on Monday April 22nd for all of your renovation needs. While we’re hoping no one will be in need this springtime, if you are looking for some extra precautionary measures for your basement and home, our Logan Avenue location currently has stock of the General Wire and Bayco models of flood guards. Call or come into 369 Logan Avenue for details or to purchase. Quantities are limited. Interested in seeing our products in person? Come into one of our two Winnipeg showrooms to view products and talk to our knowledgeable sales consultants. standards that customers come to expect.